Super Seven – 1927 to 1932, 7.9 h.p. 832.24cc 4-cylinder side valve engine with 3-speed gearbox. With the success of the small car market, especially by Austin with their Seven, Triumph offered an upmarket alternative with the Super Seven. Fitted with hydraulic brakes as standard and clothed in quality built fabric and coachbuilt bodies they were Triumph’s first car to be made in high volume. We estimate that just under 15,000 Super Sevens were produced with many being exported to Australia in ‘rolling chassis’ form (they were bodied locally in Australia). We have recorded 1780 with 156 surviving, of which 86 retain their original style bodywork. Identifying the approximate age of Super Sevens is helped by the radiator grille surround styles. 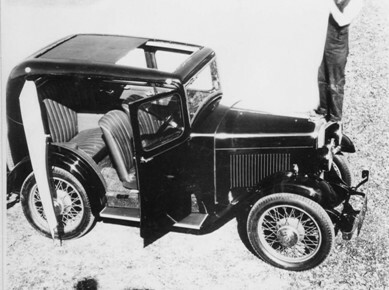 1927 to late-1929 Super Sevens have a grille surround of the same design as the larger 10/20, 13/35 and Fifteen models. Late-1929 to late-1931 models had ‘ribbon’ style surrounds and the late-1931 to l932 models had Art-Deco style flutes at the top of the surround. During the long production run many body styles were offered including; 4-Seater Tourer, 2/4-Seater Tourer, Super-Charged Sports, 2-Seater Gnat, Coachbuilt Saloons, Fabric Saloons, 2-Seater Fixed Head Coupe, Close Coupled Saloon Landaulette, Tickford Sunshine Saloon and 4-Door Pillarless Saloon. Prices varied from £149 10s for a 1927 Popular Tourer to £198 for a 1931 Tickford Sunshine Saloon. 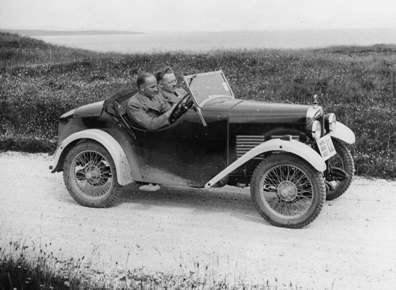 Super Eight – 1932 to 1934, 7.9 h.p. 832.24cc 4 cylinder side valve engine with 3 or 4-speed gearbox. In essence the Super Eight was a rebadged Super Seven with the addition of Magna wheels, the option of a 4-speed gearbox and bumpers fitted as standard. They can also be identified from Super Sevens by their wire mesh radiator grille and ‘ribbon’ style surround with a central vertical chrome strip. We estimate that 2,400 Super Eights were produced. We have recorded 387 with 27 surviving of which 16 retain their original style bodywork. 2 body styles were available; 2/4-Seater Tourer – £155 and 4-Door Pillarless Saloon – £155.